I've been buying 20-30 of several of the Pick-a-Model sets this year to give out as party favors at my kids birthday parties (5yo, 3yo, 7mo). I recently went to the Indianapolis Lego Store and they had the dump truck but they had the wrong wheels. The wheels they had on the wall weren't for a "wide" hub as the truck was designed for. I decided to buy all the parts for 30 trucks minus the wheels thinking I could pick up the wheels this week. I was at the Cincinatti OH store just this week but they didn't have any Pick-a-Model set on the wall. They claimed they were never sent the right parts this quarter. Does anybody have the exact part number or description of that type of wheel, or one that would at least fit the wide hubs I have? I'm not real sure how to accurately describe wheels or hubs yet. I don't want to buy a load of the wrong wheel on bricklink. Or would anybody have 120 of these wheels they'd want to sell me? I assume several people stalked up on these since they were sold out in Indy at least. If you're trying to save on shipping fees, looks like there is a seller in the USA that has at least 120 3641 for only $.02 a piece. Dang, that was awesome! Thanks for the quick response! 3641 was produced until about 2009 when 87414 was introduced as a direct replacement. Indeed, if you have an older set that came with 3641 and try to get a replacement part from TLG, they'll send you 87414. Does anybody understand the measurements of wheels and hubs? I'm seeing a first measurement followed by a "D". I assume thats the outer diameter. Is the second measurement the width? External and then internal diameter? The hubs I have in hand seem to be wider. They actually measure just over 10mm in diameter and just over 11 mm in width. I think the hub and wheels you listed above are smaller in width. Is the inventory new? I could swear it wasn't there yesterday. It lists 87697. And it does appear to be wide, not the narrow 87414. I was going on what was given, not looking at the picture. Get out a magnifying glass (and a bright light) and find the part number on the hub, then there will be no doubt. The proper description of 87697 (i.e. from Brickset, not Bricklink) is "Tyre Normal Wide Ø21 X 12" which makes it clear that the diameter (external) is 21mm; 12mm is the width. The hub does say 6014 and it has the "x" hole so it is indeed the 6014b variant I believe. I also see "11-18" on the same part of the hub as the part number, and the 18 is underlined. What does that mean? All the wheels list by samiam391 fit on a Technic half bush. That's not what's on the model, which are true hubs. If you squint, you'll find they say "6014" around the centre on one side. 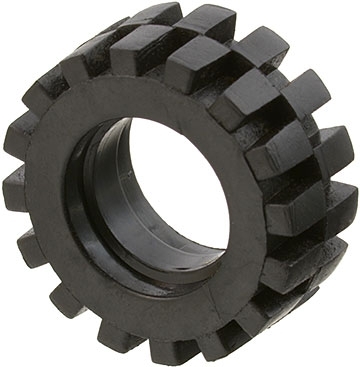 The wheels that fit are 6015 / 60700 / 87697.